Thrifters rejoice. The Plaid Door in Springfield has moved into its new location, and the prices, ambience and selection are just as great as ever. It’s all about the thrill of the hunt and never knowing what you’ll find next. Hidden between tattered polos you might just find a wonderfully kept designer top or the perfect pair of high-waisted Levis. And that lingering taste of victory is what draws shoppers back for more. At The Plaid Door, the search for the perfect top with an even more perfect price tag is extra-enjoyable. For 40-some years, The Plaid Door has been one of Springfield’s main thrifting hot spots. The atmosphere is clean and inviting, and the selection is a thrifter’s dream. 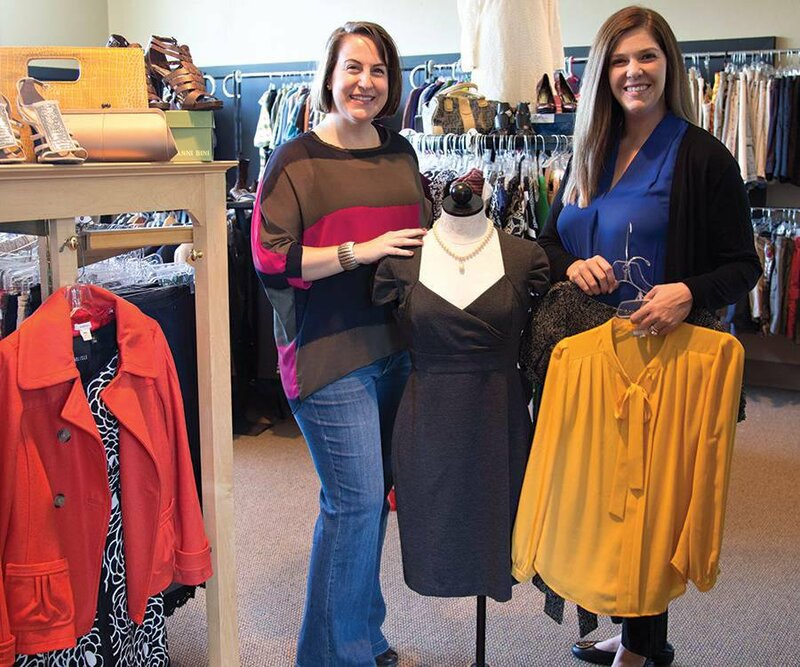 For decades, not much changed, but last June, the popular shop shuttered its store on East Sunshine Street and relocated inside the offices of The Junior League of Springfield. At the Sunshine Street location, the League had high overhead that paid for staffing, utilities and rent. By moving into the Junior League offices, they were able to simplify by reducing expenses and relying on volunteers instead of paid staff to run the store. That means what the store earns is all profit that the organization can put directly back into serving the community through its projects. The store’s new venue is a surprising improvement, as two rooms now hold the treasure trove of new and slightly used clothing, shoes and accessories. The front room houses shelves of decorative home goods. Along the opposite wall is a display of jewelry and accessories, while the middle of the space is dedicated to racks of purses. While those items provide eye candy to quickly draw shoppers in, the true delights of the hunt are in the second room. This is where you find men and women’s shoes and clothing. Wooden racks hold outfit staples while a stylish display near the back wall shows off the store’s collection of shoes. The best part? Besides taking donations from the community, the store gets boxes of designer items from some of Springfield’s most popular boutiques. That’s a big win for shoppers. 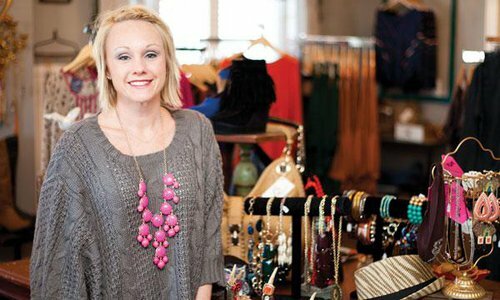 “What you find here is nicer than what you would find at a regular thrift store,” says Ashley French, president of The Junior League of Springfield. Some items on the store’s racks are brand new. Others, like a vintage pair of seersucker Burberry pants (true story), are too good to pass up. A line of eager customers forms outside each time the shop opens. You can also set up a private shopping event with some friends. Either way, be ready to discover something fabulous. 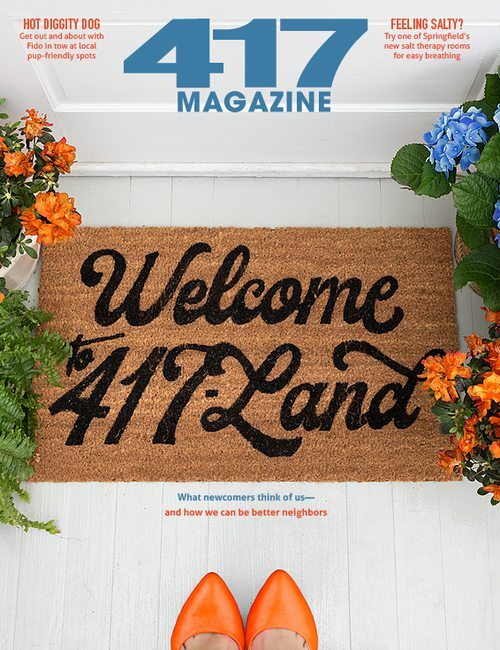 417 Magazine: What do you look for when selecting what to showcase in the store? Allison Brandt Anbari: Things we would buy or wear! Or things we could see one of our friends wearing. During grand opening, we changed one of our mannequins 5 or 6 times because we kept selling what we dressed her in. 417: What is one misconception of the thrift store? A.B.A. : I don’t think everyone knows that we have gone to a flat, standardized pricing system. We only use price tags on high-end designer items, and even then we try to price budget friendly. Shoes are only $5! 417: What are some of the most surprising finds you’ve uncovered at the store? A.B.A. : I think each JLS member probably has a favorite Plaid Door find. I have a vintage red silk shirt that I am super-proud of as well as my Bottega Veneta moccasins. My husband was ecstatic to find original print Charlie Brown comic books as well. 417: What is the advantage to shopping at The Plaid Door? A.B.A. : Well obviously that every dollar you spend goes straight back to the community via our projects, especially now that we are completely volunteer run out of our League office. But I think an advantage is also that whether a customer enjoys the hunt for a bargain or is looking for something very specific for an occasion, we will most likely be able to help that customer out. Our volunteers love helping customers shop. It’s definitely one of the perks of working during a Saturday sale. It doesn’t feel like work. We have fun, and our customers benefit a great deal from that energy.